Small businesses often find themselves dealing with the public directly. It’s no secret that many are retail and they want to accommodate most any form of payment a customer may offer. But credit card processing can often be cumbersome and difficult to do in a portable fashion like for those who use open-air sales facilities. That’s where Intuit GoPayment comes in and gives your business some credit. First, you’ll need to fill out an application, and from there, you’ll be able to use the app (which is free, but you’ll be paying based on your usage of the app itself) to start taking credit card orders. You’ll be able to create an order, with three slots, which you can then change the quantity on. 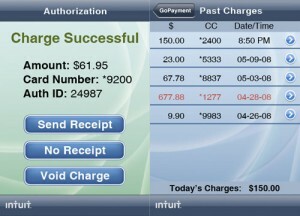 You can shift the names around (which works great if you’re selling a variety of items), change the numbers (great for where you’re selling multiples of the same item), and then from there, Intuit GoPayment will automatically figure the sales tax and make the relevant charges, once you’ve filled in the card number of choice, along with its various statistics of interest (it will even show you where to look for the card’s security code, an item that has left many puzzled in the past. You’ll also be able to track your charge history, including voided transactions, so you can see at a glance (and a finger scroll) just how much business you’ve done in a day. What I don’t like is the processing requirements to get in on this; you’re going to have to fill out a fairly substantial application to enroll in this program. And as is generally the case, you’re going to need to be in either a 3G area or a wi-fi capable location to take full advantage of it. But if you’re in the right place–and let’s face it, you’re going to want to be where people are in order to sell things to them in the first place, which is the point of Intuit’s GoPayment app in the first place–then this is definitely going to be the app you need. It’s great for any small business that deals in retail, especially those that deal in products in multiple locations, where a credit card processing terminal is impractical or otherwise inadvisable. So if you’re looking to put some spark in your small business, why not start by telling your customers that you do take credit cards? This entry was posted in Marketing, Sales, Small Business by Steve. Bookmark the permalink. Verizon suggested “Square”. Both are the same per-transaction fee but Square gets your money to you faster. Would like to hear from actually users. Watch out for the extra fees at the end of the month. You will first receive the payment statement to them with a 2.7% then at the end of the month you will receive an adjusted rate at 3.7%. 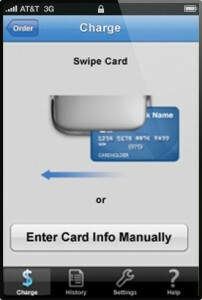 Even though it is a VISA card and can swipe it you cannot tell if it is a corporate or a qualified rate card. Be award because customer service will not care. This is the worst experience ever!!!! We processed a transaction on 8/2/13 and still have NOT received the funds yet. I have called 3 times to get his handled each was placed on hod for more then 90 minutes! This is so ridiculous!!!! We will NOT be using his system again!